As I’m sure you can imagine, taking vacations is quite difficult for farmer types. Our spring and summer seasons are so busy in the gardens, autumn is chock-full of weddings and continued harvests, followed by the holidays, and lambing in the dead of winter. It doesn’t leave much time for a getaway, and it’s also important that we are strategic with timing. Just because a week is ‘open’ doesn’t necessarily mean our minds will be able to relax while traveling, knowing there is so much work being left at home. Regardless, Brad and I have decided to take time to explore the world a bit over the next few years. After an amazing trip to London last spring (more on that to come), I realized how traveling to distant places can refresh your creativity, expand your knowledge, and inspire. We’ve settled on one big international trip per year, and a few shorter domestic trips as well. Of course focusing on good food, farming culture, and history as we go. We decided late-summer to kick off our expeditions together with an island vacation in January. I settled on St. Croix after essentially blowing up the Caribbean sea on google maps and then googling islands that seemed intriguing. The St. Croix sheep are named for this island, and are a foundation of the Katahdin, the breed developed in Maine that we raise on the farm. That paired with an assertion that the island had a small-but-growing local food scene, and we had our hearts set on this place. The island is small, driving from one end to the other taking no more than an hour. The islands’ population hovers around 50,000. Christopher Columbus landed on the island in 1493, naming it ‘Santa Cruz’, and causing devastation to the native people. St. Croix was not colonized, however, until the Dutch returned in the 17th century. 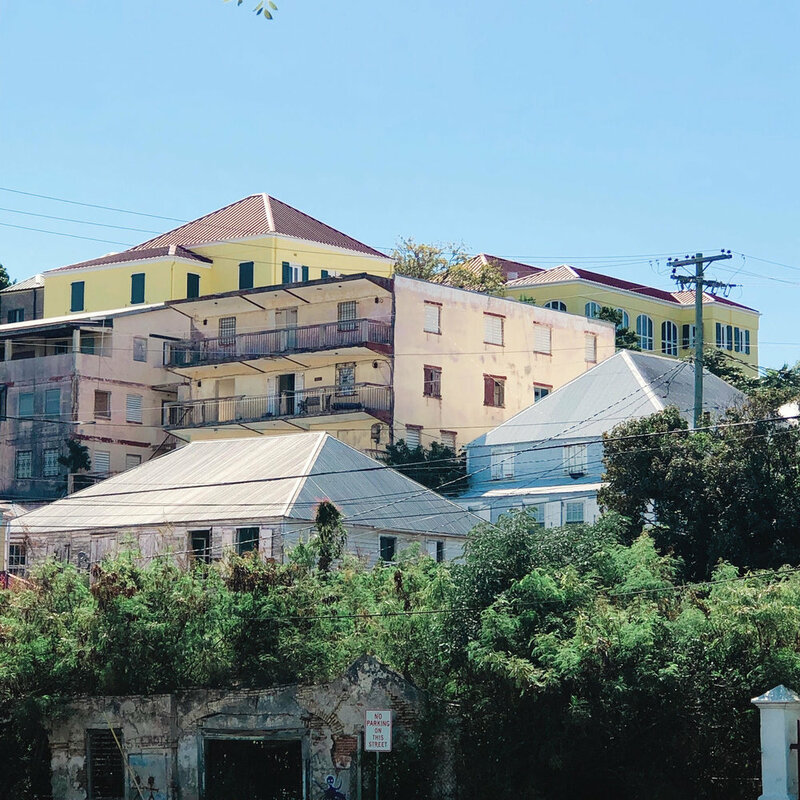 The historic town of Christiansted boasts streets of charming arched openings painted in pastel, and the town’s scale house, fort, and meeting house have been preserved. A notable resident of the island was a young Alexander Hamilton, who began his career on the island before local businessmen funded his voyage to New York. Both of us having never been to the Caribbean, we were quite interested to explore the natural areas on the island. Our Airbnb hosts directed us to a hike to the tide pools on the North Shore. A three mile hike through the rain forest, followed by some careful climbing leads you to the most beautiful, crystal clear water surrounded by black coral rock formations. The seclusion of the island was staggering. We were the only two people there for about an hour. Our favorite part of the whole trip was our snorkel at Buck Island. 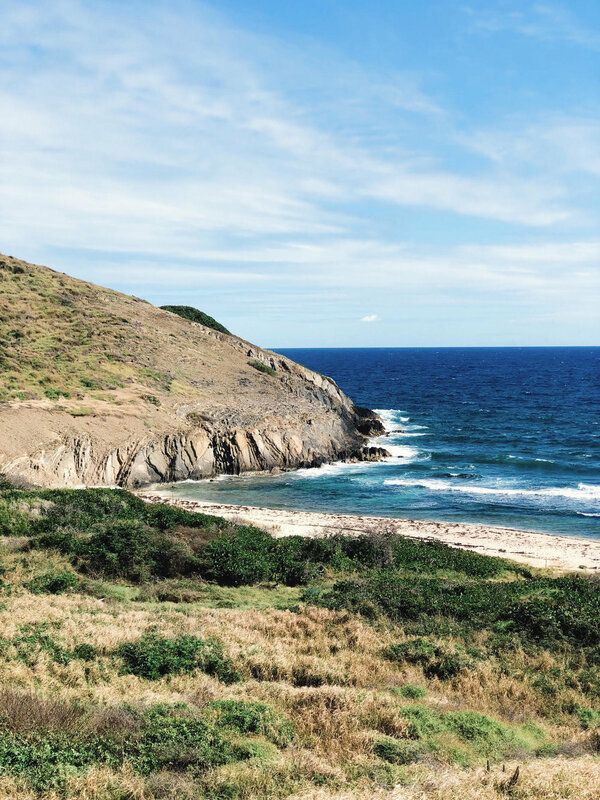 This tiny island just north of St. Croix is a National Monument, boasting some of the best snorkeling the planet has to offer. The magnitude of coral and diversity of fish was like swimming through the zoo’s aquarium. I am most certainly not a savvy swimmer, in fact I was quite nervous about this part of the trip, but I quickly set aside my fears and was quite determined to flail my way through the sea and burn the images of this natural wonder in the back of my brain. Our incredible guides from Caribbean Sea Adventures were so knowledgeable and caring toward the sensitive natural habitat on and surrounding Buck Island. 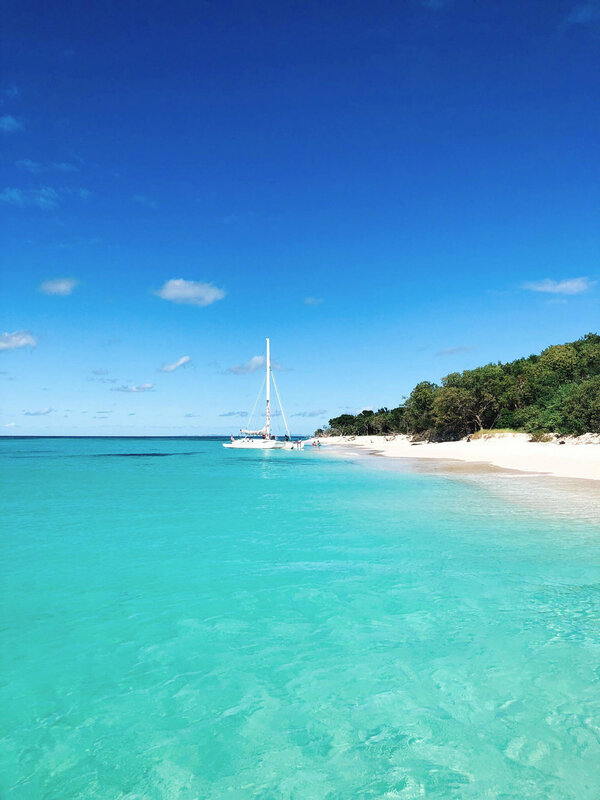 After our snorkeling, we were taken to the beach on the west end of Buck Island, to enjoy the pristine beach and crystal clear water of this national wonder for some time, prior to boating back to Christiansted. Our interest in the local agriculture led us to the middle of the island, where the shepherds tend their flocks of the namesake St. Croix sheep. These sheep are a hardy breed, native to the Caribbean, with a shedding hair coat and unmatched resistance to parasites. These traits were used to develop the meaty Katahdin breed that is raised here on Old Slate Farm. Seeing these sheep on this particular island was a delight. We also got to tour a tropical flower farm. An unplanned expedition- a few road signs led us to Trops Flower Farm on the North Shore of the Island. We sheepishly pulled into the driveway, having had no appointment, but we were quickly greeted by the owner, Debbie, who graciously took us on a tour of her small but beautiful operation. Having only seen these tropical flowers and foliage out of context, it was amazing to see them in cultivation, and I’ve certainly gained a new appreciation for these colorful, unique flowers. St. Croix is also home to another gorgeous floral attraction: The St. George Village Botanical Gardens, set on a former sugar cane plantation. The gardens wind through the ruins of the processing facility for the sugar cane and through the surrounding areas, and the history of the horrific lives of the enslaved workers who harvested and processed the sugar cane was displayed in a museum on the property. Of course the food on the island was quite a focus for the two of us. A blossoming local food interest on the island has attracted several chefs to the area who are serving some delicious meals. Often sleeping through breakfast, we would hit up one of the many beachside bars for a lunch of mahi-mahi or wahoo, and a fruity rum cocktail or two, ‘to-go.’ The island is also home to the Captain Morgan and Cruzan Rum distilleries, and tours are available for both. We toured Cruzan, and filled our suitcase with bottles to take home, and hopefully take us back to the warm sunshine on these punishing mid-winter days. We dined at Kim’s, run by a local woman who is serving up the most delicious Crucian food. We devoured our braised oxtails, and a platter of mixed seafood: think local lobster and conch (in season during the winter months), with seasoned rice and beans. Kim’s is a must-visit on the island. Our dinner at Savant was equally enjoyable, with an impressive wine list and beautiful patio. But we were truly blown away by the food and cocktails at Zion Modern Kitchen. The food was fresh, delicious, and interesting, and the outdoor setting was charming and so very memorable. When we go back, we have a few other locales on the list for more authentic, island cuisine. 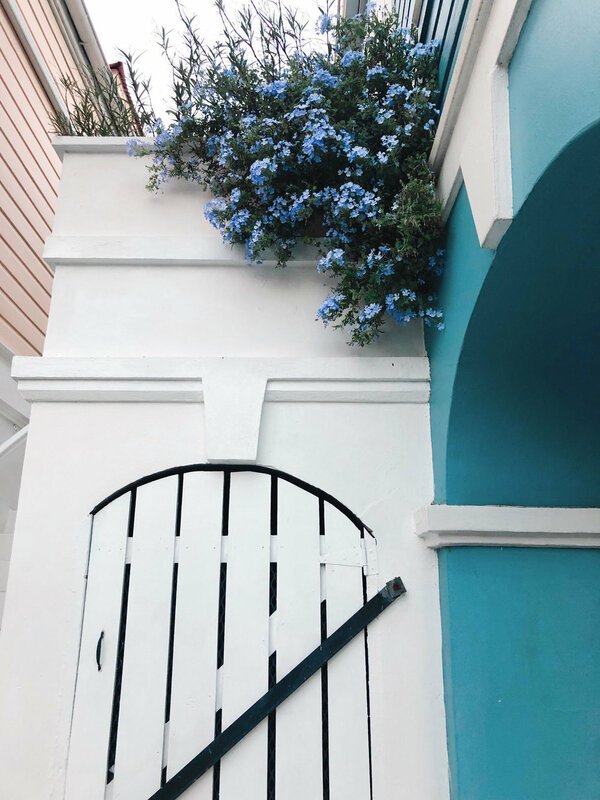 We loved exploring this beautiful island, full of friendly and welcoming locals who were excited to share all the island has to offer. I’m anxious to return.